Shelves lie empty in the few pharmacies left open in the Venezuelan border town of Urena. There are no medicines, just a few packets of cotton wool and boxes of plasters. A few miles away, on the eerily quiet bridge to Colombia, a fuel tanker and shipping containers, placed there by the military, sit across the empty lanes ready to block millions of dollars of US aid. In a sign of increasing desperation, residents in Urena say they are ready to turn on the security forces if the aid is not allowed in. “We are absolutely ready to resist if the government does not allow the aid to enter,” Unay Bayona, a chef and youth worker, said as the stand-off continued to escalate last night. Sixty tons (55 tonnes) of food and medicine began arriving from the US yesterday and was placed within viewing distance of Venezuela in a high-stakes game designed to put pressure on Nicolas Maduro, the president – and stoke unrest among the local population. Protests that have shaken the country since last month have failed so far to topple the socialist regime blamed for the widespread shortages. “The people will not hesitate to take to the streets and even take up arms if we have to,” Mr Bayona said. “There is no doubt they will deploy the army, but they are on our side. They won’t fire on their own people,” he said, underlining the stark choice security forces are likely to face if ordered to block the convoy. The aid was called in by Juan Guaido, the opposition leader and self-appointed interim president, who has been recognised by 40 countries so far, in a challenge to Mr Maduro. There are increasing signs that even some of the most hardened pro-Maduro groups are beginning to turn on the regime. Kiki, in his 40s, who withholds his full name for fear of reprisals, belonged to a “colectivo”, an armed militia called on by the regime to suppress dissent. He left the group and moved to Urena two years ago. 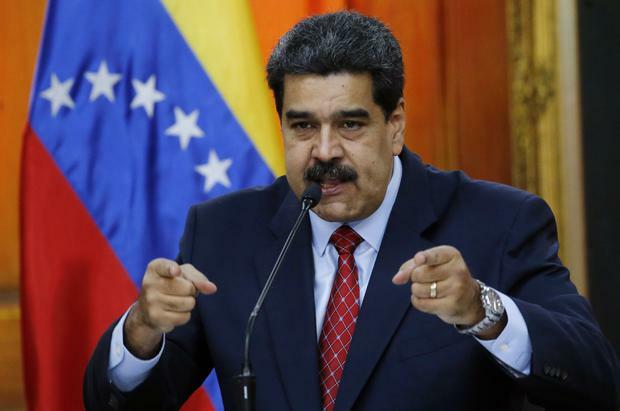 Mr Guaido’s gamble looks to be a lose-lose situation for Mr Maduro. If he lets the aid in, he tacitly acknowledges Mr Guaido’s authority. If he doesn’t, he risks further inflaming unrest. But a successful blockade will prove the one thing Mr Maduro is relying on – that the military remains loyal. In Caracas, queues formed outside pharmacies yesterday as residents waited for dwindling supplies of medicines. “This is a criminal act,” said Javier Rondon, referring to the regime blocking aid, as he waited for an antibiotic to treat his five-year-old daughter’s lung infection. “We are eating up the little bit of savings we’ve saved in years and years of work, and our lives are being torn apart by a group whose only interest is to remain in power,” said Jose Pereira (56), as he waited to buy medication to treat his 95-year-old mother’s Alzheimers.